Gene Roddenberry was an America television producer and screen writer. He is probably best remembered as the creator of the television series Star Trek. In 1985, Gene Roddenberry became the first television screen writer to receive a star on the Hollywood Walk of Fame. He was also inducted into the Academy of Television Arts & Sciences Hall of Fame and the Science Fiction Hall of Fame. Gene Roddenberry died in 1991 and the following year some of his ashes were flown into space aboard the space shuttle Columbia. Five years later, more of his ashes were sent into space and orbited the Earth for several years before burning up in the atmosphere as the spaceship they were aboard disintegrated as its orbit deteriorated. Another plan to launch his ashes into deeper orbit is planned for sometime in the near future. As creator of the Star Trek television series, it seems only fitting that a rocket scientist should be in Gene Roddenberry’s family tree with a kinship to the inventor of the first liquid-propelled rocket Robert H. Goddard. He also has a few former U.S. Presidents among his famous kin. These include William Howard Taft, Herbert Hoover, Warren G. Harding, Richard Nixon, and both Presidents Bush. 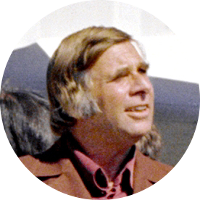 Gene Roddenberry has a family connection to a number of fellow celebrities including actor Orson Welles, comedian and actor Chevy Chase, actress Paget Brewster, Back to the Future actor Christopher Lloyd, singer and songwriter Janis Joplin, actor James Spader, actress Anna Gunn, and singers Donny & Marie Osmond. His literary kin include Tennessee Williams, Harriet Beecher Stowe, Edgar Rice Burroughs, and John Steinbeck. Other notable kin to Gene Roddenberry include Green Bay Packers quarterback Aaron Rodgers, artist Norman Rockwell, Civil War General William Tecumseh Sherman, Prime Minister Sir Winston Churchill, American Red Cross Founder Clara Barton, women’s rights advocate Susan B. Anthony, American legend Johnny Appleseed, and accused murderess Lizzie Borden.